Given the metal chips flying around a machine shop, the electronic circuit board must be completely encased to avoid damage. 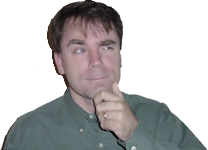 Furthermore, the optical sensors need to have ambient light screened out to avoid misreading the reflected light. I racked my brain to come up with an attractive, perfectly-fitting cover for the tachometer project. I even went so far as to order 2-inch diameter solid brass rods from an eBay auction. But I couldn’t bear to bore away such a large chuck of brass. 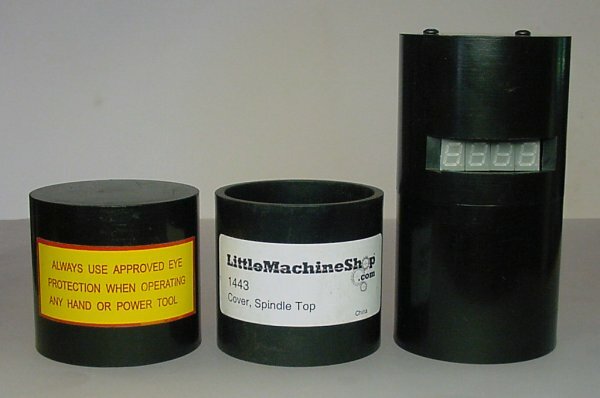 Electronic tachometer project made by stacking two replacement spindle covers from Little Machine Shop. The casing for the tachometer circuit board is made by simply stacking two of the standard spindle caps. These are stocked as replacement parts (#1443) at Little Machine Shop for $2.95 each. The material is opaque (prevents sensor interference from external lighting), the appearance is original, and the fit is factory perfect. I didn’t know how many caps I’d damage during prototyping, so I ordered 10. They sent some, but ran out of stock at Little Machine Shop. They eventually shipped the remaining caps that were backordered. However, I was surprised they never called me to ask what in the world I was doing with them. I mean, I can see losing one cap, but 10? Using off-the-shelf parts saved me a lot of machining. However, the display slot, screw holes, and power/data cable notch still needed to be machined. 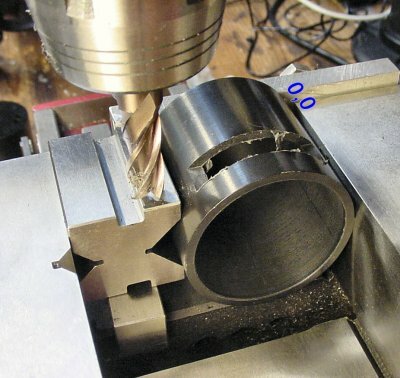 Using a vise stop and visual indicator tool to set the DRO origins to 0,0 on a milling vise. The sides of better-quality milling vises have bolt holes to attach a side plate. This becomes a positive stop for a workpiece, which you can use as a left-hand or right-hand origin. By adding a digital caliper to each axis of the milling machine, locations can be measured digitally. This makes accurate positioning easy! Let me explain how to do it. To begin, insert a visual indicator tool (I use a Borite Machinist Mate electronic edge finder -- McMaster-Carr #2039A12 for $26.73) into the collet or drill chuck. When the tip of the tool touches anything electrically conductive (metal), it lights up. The diameter of the tip of the indicator is 0.2 inches, so this tells you that the center of the chuck is now 0.1-inch (half the tip’s diameter) from the edge you’re presently touching. 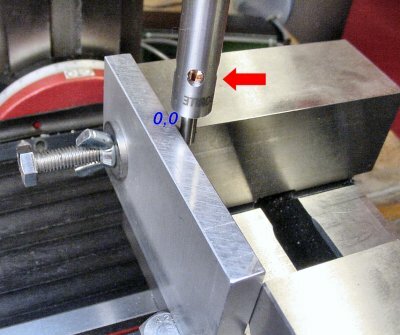 Position the table so that the tip of the indicator tool touches the rear jaw of the vise (lighting up the tool), and type 0.1 into the y-axis of the digital display. Position the table so that the tip of the indicator tool touches the added side-stop of the vise (lighting up the tool), and type 0.1 into the x-axis of the digital display. Now the upper-left corner origin of the vise is 0,0. Place a workpiece into the vise. Shove it against the left side-stop and the rear jaw of the vise. The corner of the workpiece is now located at 0,0!! To drill a hole 0.5, 0.5 inches from the corner, simply move the table until the digital display reads 0.5, 0.5. You can create a template full of coordinates relative to a 0,0 top-left corner and they’ll be accurately positioned using the digital display. 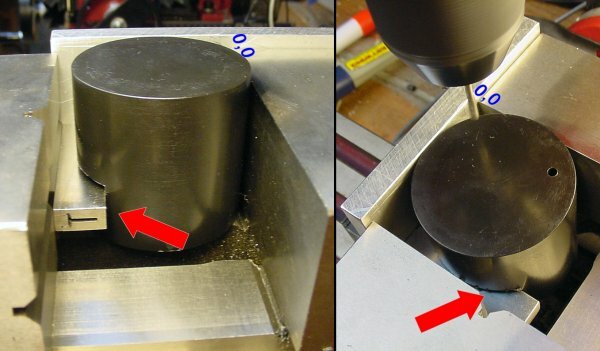 Even the slots and holes in the plastic (non-conductive) spindle cap can be positioned accurately, because the top-left of the vise has been set to 0,0. 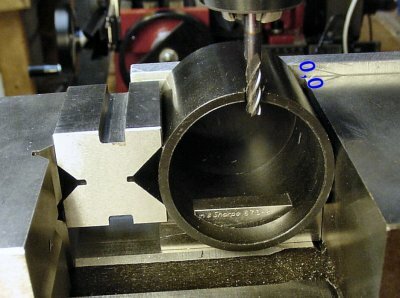 A v-block holds the cylindrical spindle cap cover in place during machining. A v-block on the rear jaw of the vise holds the spindle cap cover cylinder firmly while the LED display slot is cut. Determining the correct depth was a little more difficult. I tried inserting the circuit board, cut a little and tried again, and so on until it fit. After a slot is cut into a cylinder, it can be held squarely by placing a rectangular parallel block into the slot. The nice thing about having a slot or flat detail machined into a cylinder is that it can then be positioned and held somewhat like an ordinary rectangular piece. For example, this helped during the drilling of the holes for the screws that connect the top cap to the bottom cap. Furthermore, this made sure that the holes were parallel to the front slot. Otherwise it would have been really difficult to make sure the holes mated to the screw holes on the circuit board while the LEDs fit exactly in the cap slot. Put simply: The slot makes it easy to hold in a vise. The slot also makes it easy to drill the screw holes in the correct places relative to the front. A v-block and parallel block position a machined cylinder while a notch is cut for a cable. The finishing touch is the notch in back for the power/data cable.